Backyard gardening has never been fun since I learned all about nitrogen-fixing plants and crops and how they can be used in a garden set up to help produce healthier more vibrant and vigorous vegetables and plants and at the same time contribute to organic and natural farming. After reading it from wikipedia and learning all about it from a video I was able to watch about the master of One Straw Revolution, master farmer Masanobu Fukuoka and his permaculture technology system, it came to my mind to try out the principle. I got me some straw from Cavite house back last week after observing Lenten or Holy Week there with my family, Ana (my wife) and TJ (our one and only daughter). You can read about him here – http://www.permaculture.com/node/140. Anyways, you can watch the video below that I embedded from YouTube.Com. 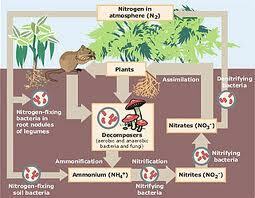 (photo courtesy of http://en.wikipedia.org/wiki/Nitrogen_fixation). As I develop my skills in vermiculture and composting, I am currently experimenting on something I learned about bokashi composting which intrigued me a bit more than nursing and farming worms called African Nightcrawlers or ANC and producing vermicast, a healthy organic fertilizer and soil conditioner we use in our containers. Bokashi seemed faster than composting kitchen scraps from out of letting the worms eat them and the worm casting microbes eat up and compost the scraps. I can just imagine billions of beneficial microbes or indigenous microorganisms (IMO) eating away bad bacteria and literally killing the bad smell from your compost while composting your kitchen scraps way faster than the usual composting methods and vermicomposting. Anyway, back to the nitrogen-fixing crops /plants I just mentioned, since I am not really farming from in here in our backyard garden in Caloocan, I would like to take it to a point that there is definitely a big difference between actual large scale farming compared to backyard gardening and farming. With a backyard small lot set up, all I can do is to plant nitrogen-fixing plants than actually planting big acacia trees beside a big lot which is what master Masanobu Fukuoka did in his One Straw Revolution story. I was surprised as I’ve stated above upon taking a search in Google about these interesting nitrogen-fixing plants that there are already some of them growing in our garden. First, we are currently farming our murstard and that is one of the start up crops that can be used to regain soil fertility and vigour by fixing the nitrogen in them. In the compost bin we made last year is where I found something more interesting. 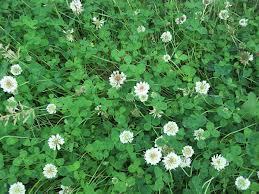 We used to put all our kitchen scraps there but today after reading about these interesting plants, I found out that our compost bin is already nursing beside its edge some interesting small weeds which turned out to be the small white clover plants (see picture beside). I came to know about it upon using Google Image search and finding out that I already have some of these little interesting plants on our small garden. Another timely interesting find is that mustard can be a cover crop for our containers where we plan to plant more varieties of vegetables. We’ve just finished harvesting our organic tomato and pechay in there a couple of weeks ago and have started growing mustard from seeds. I’ll be writing updates about the straw implementation we did just today and will also be posting up pictures here so you, our visitors can see that we are actually implementing the principles that we believe in regarding backyard gardening, container farming, natural and organic farming, permaculture and using organic fertilizers via compost adding to the soil. Will also be posting updates on our new and latest experiment regarding culture of IMO and using it for bokashi composting methods.